Chef Crawford is part of the Flights of Chardonnay CRU on Friday, July 20th. 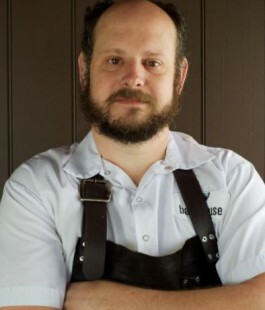 Celebrated Chef Ryan Crawford and his wife and business partner, Beverley Hotchkiss operate Backhouse Restaurant, in the heart of Niagara Wine Country. Chef Crawford studied at the noted Stratford Chef School and then became an instructor there for four years. He has travelled extensively, staging at The French Laundry and Terra Grill in Napa Valley; l’Orangerie, Lucques and Patina in Los Angeles, and Jardinière in San Francisco. Closer to home, he has worked with Michael Stadtländer and Jamie Kennedy. He has received numerous accolades for his commitment to the Ontario Culinary Scene. Chef Crawford’s approach to ‘cool-climate cuisine’ extends beyond a mere farm to table approach — he has integrated a 3-acre farm and a full-time farmer into Backhouse ensuring that your experience starts with the freshest product possible and establishing a foundation for a culinary journey that remains forever memorable. To learn more about Backhouse Restaurant click HERE!